Teen Arrested for Somersaults on School Lawn; District Says Risk of Criminal Records "Not Our Business"
One of the largest school districts in the Bay Area is defending its discipline policies after an NBC Bay Area investigation revealed children were being left with arrest records for what some described as just childish misbehavior at school. One of those students is Kai Segura, now 18, who as a freshman at Leland High School in San Jose, saw a muddy field and slid on it, doing somersaults as friends cheered him on. He saw the yellow tape circling the school lawn. He knew not to do it. But he saw the slippery opportunity, and as a 15-year-old, simply went for it. The stunt, captured on video, landed him with a juvenile arrest record for what he describes as an innocent lapse in judgment. Kai was caught up in what is seen by some parents as a larger issue: School administrators call police officers when there’s trouble, no matter how big or small – a result that can often land teens with hard-to-expunge criminal records. Critics call the policies Draconian. But at least one school district leader said what happens when the police are called is not the district’s problem. “I take care of discipline for the district…and if consequences go beyond that into the legal realm, that’s not our purview, that’s not our business,” said Dane Caldwell-Holden, director of student services for the San Jose Unified School District. Last year, NBC Bay Area examined 20 of the largest school districts in the Bay Area, and discovered San Jose Unified School District ranked second in the number of students it referred to law enforcement during the 2013-2014 school year, which means school districts with even larger student populations still sent fewer students to police when compared to San Jose Unified. Referrals to law enforcement can often result in a police officer issuing a juvenile citation to a student, which is equivalent to an arrest. Despite the fact these citations leave students with a juvenile arrest record, San Jose Unified School District says what happens to students once police get involved is not their concern. Caldwell-Holden has been in his position for three years and said he has worked hard to bring down the number of suspensions and expulsions for students. However, when it comes to the use of police on school campuses, Caldwell-Holden said the district isn’t responsible when students end up with criminal records, even if it is the result of minor infractions. San Jose Unified School District referred 203 students to police last year, down from 283 the year before. But NBC Bay Area also found that certain students are being impacted at disproportionately high rates. Hispanic students, for instance, make up 53 percent of the school district, but represent 73 percent of the students sent to police. Caldwell-Holden insists the district isn’t relying on police for routine disciplinary issues. Yet critics argue that is exactly what is happening at many school districts in the Bay Area that employ police officers on school campuses, including San Jose Unified. Several videos taken in November 2012 by several of Kai’s classmates show the teen doing a series of somersaults across the muddy lawn, while being cheered on by other students. Kai was suspended for four days for his antics, but he was also given a juvenile citation. The citation Kai received – for trespassing and disturbing the peace – means he was technically arrested. Kai had to meet with a probation officer, who ruled that his actions were not severe enough to recommend criminal charges. Kai and his mom, Raylene Fedor, thought that was the end of it until they saw NBC Bay Area’s investigation that revealed kids who receive juvenile citations while at school could still be left with a criminal record, even if the probation department declines to pursue charges. Fedor called the probation department and confirmed her son still has an arrest on his record, which he will now have to petition a judge to remove. Fedor used to be a law enforcement officer herself, serving as a reserve deputy in Minnesota for five years before her family moved to California. She has immense respect for police officers, but says officers are put in an incredibly difficult and dangerous situation when school districts do not clearly define the roles of campus law enforcement. Of the 20 largest school districts NBC Bay Area reviewed, 85 percent have officers on campus. But of those districts, only 35 percent have written agreements with police to detail the role of officers. San Jose Unified contracts with the San Jose Police Department to place officers at 14 schools, but NBC Bay Area discovered there is no written policy detailing what exactly those officers should be doing on campus. NBC Bay Area also learned the San Jose Police Department only requires 30 minutes of training for officers on school campuses, even though the US Department of Justice recommends 40 hours of additional training for those officers. Fedor says that is unacceptable. Haldwell-Colden says he’s been happy with the officers on San Jose Unified and that it’s not the district’s responsibility to ensure those officers are properly trained. Following NBC Bay Area’s investigation, the San Jose Police Department now plans to have a written policy in place by next school year that will detail the responsibilities of its school-based officers. This summer, some of those officers will also get 40 hours of additional training instead of the current standard of just 30 minutes. 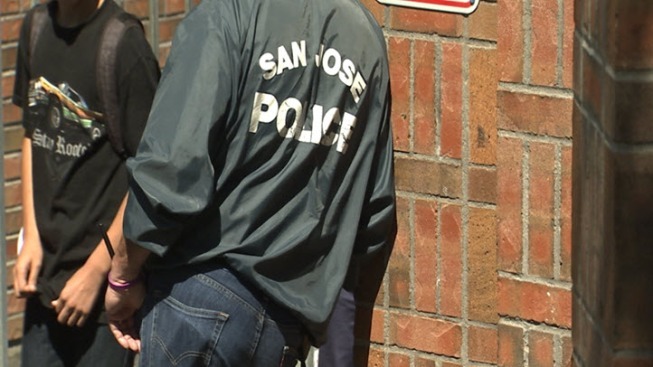 San Jose police, however, says the district also has a role to play in the process, and says its officers generally look to school administrators to find out when it is appropriate to give a student a juvenile citation. The planned changes will come too late for Kai. His arrest could remain on his criminal record even as an adult. Now that he is 18, he can legally apply to have his record sealed. There are no guarantees, however, a juvenile court judge will rule in his favor. Kai and his mother now worry about how his arrest record might impact his future. Kai had hoped to join the very police department that issued him the citation, but has since changed his mind.